Simply awesome free tool for 3D modeling. SketchUp allows you to very quickly model ideas in 3D- zoom in/out, rotate, and even create fly-through videos of models. An extensive repository of models exists in the 3D Warehouse that are free to use or add to yourself. SketchUp can be used to create your own library of components and models as well. Extensions and scripting are also supported. The interface takes a little getting use to, but quickly becomes second-nature. Many training videos are available that can get you quickly up to speed. Both a free and pro (paid) version are offered; the free version can support virtually everything a Maker needs. KiCAD is an open source software suite for electronic design automation (EDA) – designing schematics of electronic circuits and printed circuit boards (PCB). KiCAD is developed by the KiCAD Developers Team, and features an integrated environment with schematic capture, bill of materials list, and PCB layout. The 3D PCB viewing function is implemented with the Wings3D subdivision modeler. KiCAD has a built-in basic autorouter. Alternatively, the freeware java-based FreeRouting can be used. The Eclipse Platform is a multi-language software development environment comprising an integrated development environment (IDE) and an extensible plug-in system. It is written mostly in Java. By means of various plug-ins, it can be used to develop applications in various programming languages including Ada, C, C++, COBOL, Erlang, Java, Perl, PHP, Python, R, Ruby (including Ruby on Rails framework), Scala, Clojure, Groovy and Scheme. The Eclipse SDK (which includes the Java development tools) is meant for Java developers. Users can extend its abilities by installing plug-ins written for the Eclipse Platform, such as development toolkits for other programming languages, and can write and contribute their own plug-in modules. 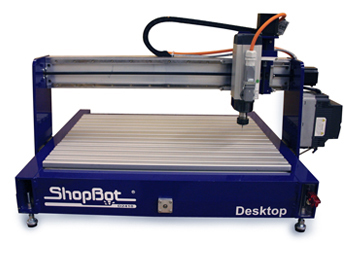 ShopBot offers CNC routers for fabricating in wood, plastic, aluminum, and other materials. They have been supplying tools ranging from industrial to low-volume models (like the desktop version pictured here) since 1996. The ShopBot Wiki is a good place to find information on the tools and their use.